Question No.1: If only part payment of the tax, surcharge and penalty payable on undisclosed income declared under the Scheme is made before 30.11.2016, then whether the entire declaration fails as per section 187(3) of the Finance Act, 2016 or pro-rata declaration on which tax, surcharge and penalty has been paid remains valid? Answer: In case of part payment, the entire declaration made under the Scheme shall be invalid. The declaration under the Scheme shall be valid only when the complete payment of tax, surcharge and penalty is made on or before 30.11.2016. Question No.2: In case of amalgamation or in case of conversion of a company into LLP, if the amalgamated entity or LLP, as the case may be, wants to declare for the year prior to amalgamation/conversion, then whether a declaration is to be filed in the name of amalgamated entity/LLP or in the name of the algamating company or company existing prior to conversion into LLP? Answer: Since the amalgamating company or the company prior to conversion into LLP is no more into existence and the assets/liabilities of such erstwhile entities have been taken over by the amalgamated company/LLP, the declaration is to be made in the name of the amalgamated company or the LLP, as the case may be, for the year in which the amalgamation/conversion takes place. Question No.3: Whether the Scheme is open only to residents or to non-residents also? Answer: The Scheme is available to every person, whether resident or non-resident. Question No.4: If undisclosed income relating to an assessment year prior to A.Y.2016-17, say A.Y. 2001-02 is detected after the closure of the Scheme, then what shall be the treatment of undisclosed income so detected? Answer: As per the provisions of section 197(c) of the Finance Act, 2016, such income of A.Y. 2001-02 shall be assessed in the year in which the notice under section 148 or 153A or 153C, as the case may be, of the Income-tax Act is issued by the Assessing Officer. 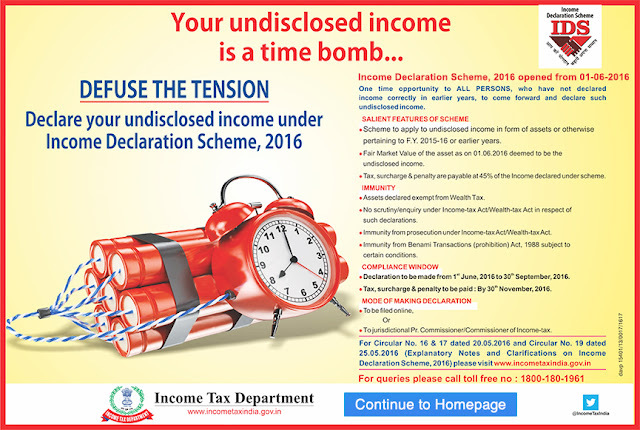 Further, if such undisclosed income is detected in the form of investment in any asset then value of such asset shall be as if the asset has been acquired or made in the year in which the notice under section 148/153A/153C is issued and the value shall be determined in accordance with rule 3 of the Rules. Question No.5: Whether a person on whom a search has been conducted in April, 2016 but notice under section 153A is not served upto 31.05.2016, is eligible to declare undisclosed income under the Scheme? Answer: No, in such a case time for issuance of notice under section 153A has not expired. Hence the person is not eligible to avail the Scheme in respect of assessment years for which notice under section 153A can be issued. Question No.6: As per Circular No.17 of 2016, question No.14, it is not mandatory to attach the valuation report. But Form-1 states “attach valuation report”. How to interpret? Question No.7: Is it mandatory to furnish PAN in the Form of declaration? Answer: Yes, PAN is the unique identifier for all direct tax purposes. This is also necessary in order to claim the benefits and immunities available under the Scheme. Question No.8: If any proceeding is pending before the Settlement Commission, can a person be considered eligible for the Scheme? Answer: No, a person shall not be eligible for the Scheme in respect of assessment years for which proceeding is pending with Settlement Commission. Question No.9: Land is acquired by the assessee in year 2001 from assessed income and is regularly disclosed in return of income. Subsequently in the year 2014, a building is constructed on the said land and the construction cost is not disclosed by the assessee. What shall be the fair market value of such building for the purposes of the Scheme? Answer: Fair market value of land and building in such a case shall be computed in accordance with Rule 3(2) by allowing proportionate deduction in respect of asset acquired from assessed income. Question No.10: Whether cases where summons under section 131(1A) have been issued by the Department or letter under the Non-filer Monitoring System (NMS) or under section 133(6) are issued are eligible for the Scheme? Answer: Cases where summons under section 131(1A) have been issued by the department or letters for enquiry under NMS or under section 133(6) are issued but no notice under section 142 or 143(2) or 148 or 153A or 153C [as specified in section 196(e)] of the Finance Act, 2016 has been issued are eligible for the Scheme. Question No.11: If notices under section 142, 143(2) or 148 have been issued after 31.05.2016 and assessee makes declaration under the Scheme then what shall be the fate of these notices? or misrepresentation and the amount payable under the Scheme has been duly paid within the specified time. On furnishing by the declarant the certificate issued by the Pr. Commissioner/Commissioner in Form-4 to the Assessing Officer, the proceedings initiated vide notice under section 142, 143(2) or 148 shall be deemed to have been closed.